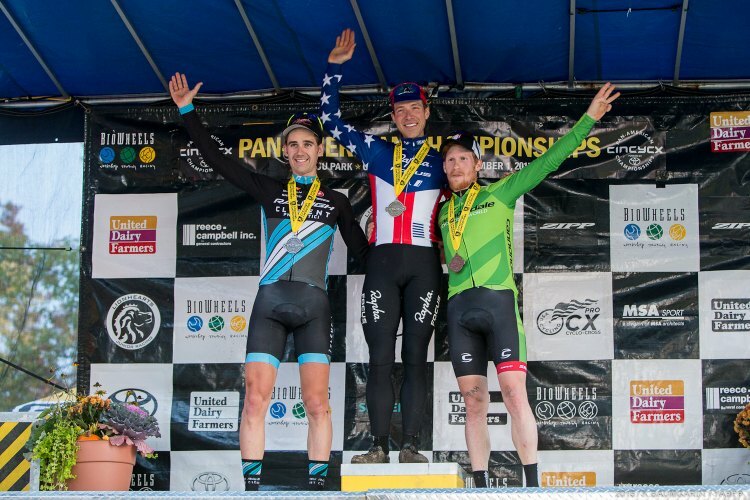 Jeremy Powers Powers takes the Pan-American Championship win while Driscoll and Hyde sprint it out for second and third. 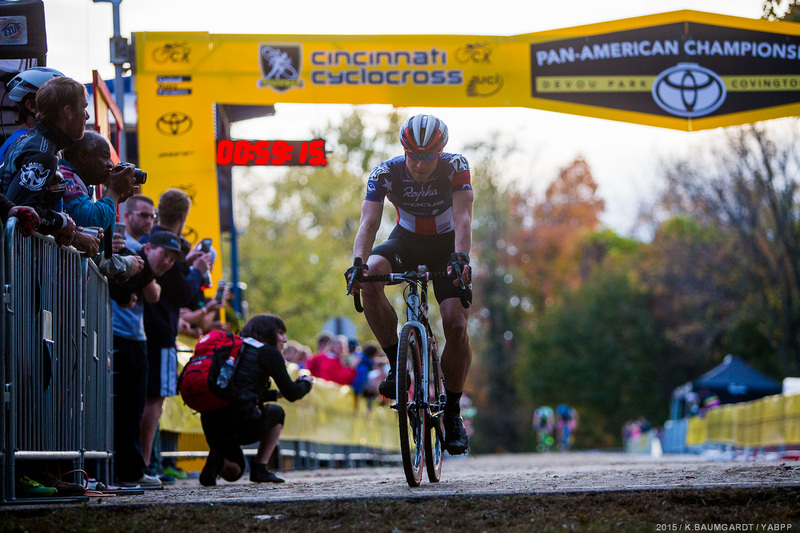 Jeremy Powers won the Elite Men’s Pan-Am Championship Sunday, barely besting Stephen Hyde and Jamie Driscoll in what may have been the most thrilling American cyclocross race of the year. Trek Factory Racing’s Katie Compton won the Elite Women’s Pan-Am jersey with yet another dominating performance, while two up-and-coming teammates battled back from mechanical mishaps on Saturday to take their own victories on the second day of the Cincinnati Cyclocross Festival. The course at Devou Park was a stark contrast to the speedier course at Kings CX the previous day. Several racers compared Devou to more-difficult European courses, with its rolling power sections, tricky off-camber slopes, and naturally, lots of mud. The age-group riders earlier in the day battled slippery lines and gummed up derailleurs, but sunshine and an unseasonably warm November day helped dry the course by the time the Pan-Am Championship races began Sunday afternoon, but many churned and greasy sections remained virtually unrideable. The difficulty of the climbs, corners, and run-ups was visible on the riders’ faces. 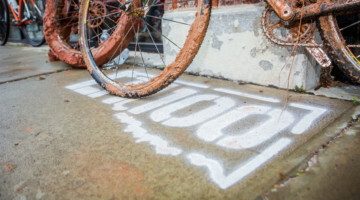 But they had plenty of fan support to get them through the extra-difficult sections of the course, especially going up ‘Shamrock Hill,’ a slick, nearly-vertical mound that forced riders to dismount and carry their bikes as they climbed up the muddy slip-and-slide. 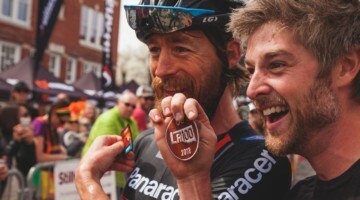 Pan-Am Plunge, a twisty 70-foot, off-camber drop also caused the riders consternation each trip around the course, with the sounds of squealing cantilever brakes echoing through the Ohio hills. Spencer Petrov, winner of the Junior’s race, rolling across the line. Spencer Petrov (Cyclocross Network) took the early lead in the Juniors race, with a few riders on his heels, and Eric Brunner (Boulder Junior Cycling) and Saturday’s winner and reigning Pan-Am champion Gage Hecht chased closely at the beginning, but Petrov would eventually claim victory. For Petrov, who was leading Saturday’s race until an untimely mechanical in the second lap, earning the victory on his home course and in front of family and fans was especially sweet. Drew Dillman was able to defeat reigning Pan-American champ, Curtis White. 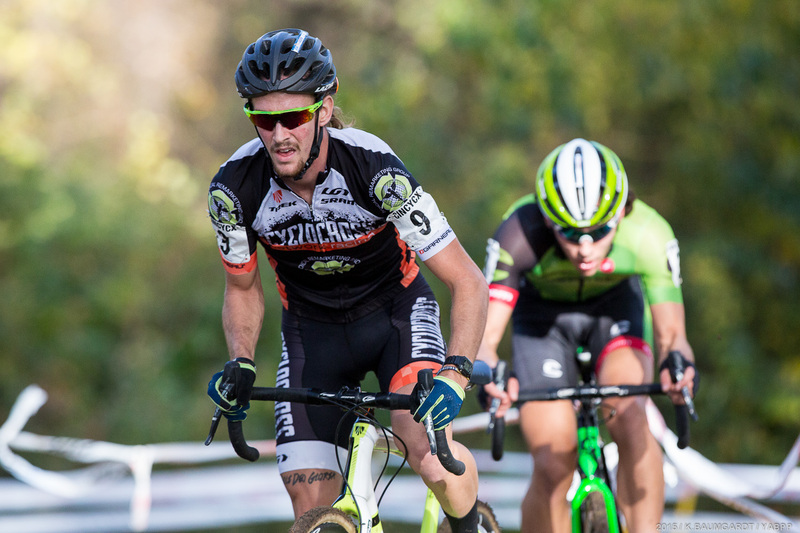 Petrov’s teammate Drew Dillman also suffered a mechanical in Saturday’s race, but battled back to finish in the Top 10 in the Men’s Elite Field. 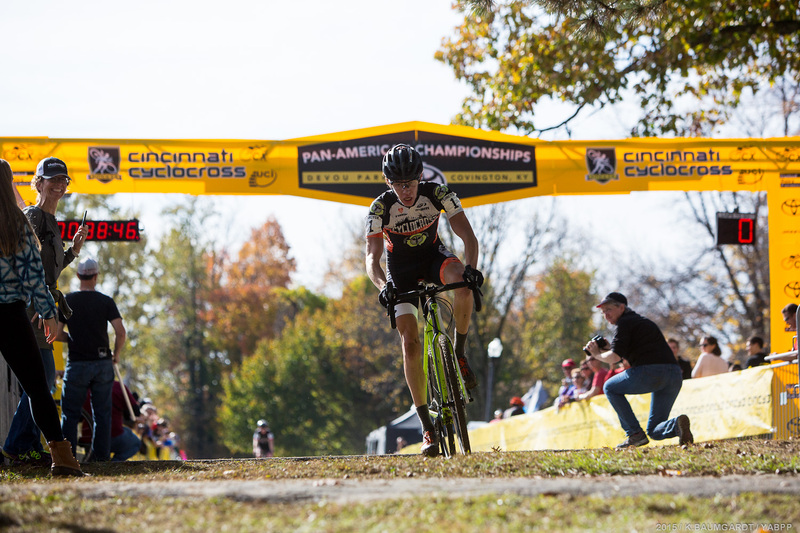 On Sunday, he would capture the win in the Elite Men U23 field after putting a big dig in on eventual second-place finisher Curtis White (Cannondale p/b Cyclocrossworld) with four laps to go. 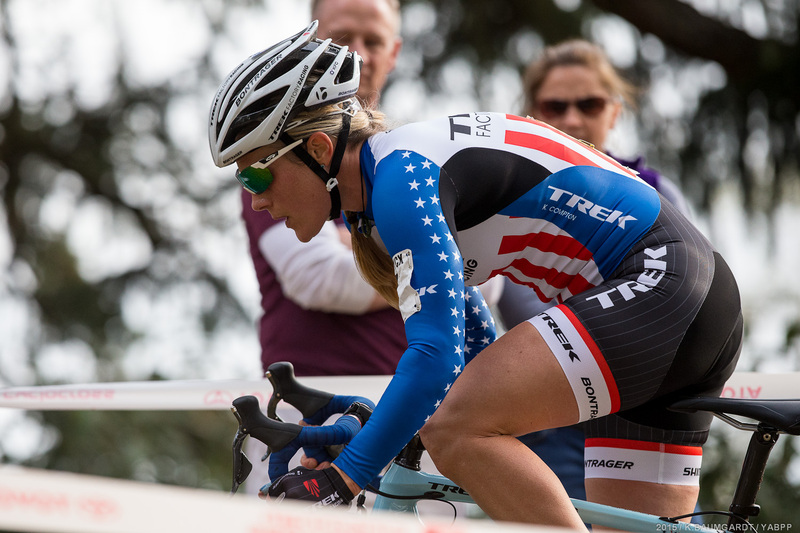 Ellen Noble opened a gap early in the U23 Women’s race, and held it for the win. The Elite U23 Women’s field splintered on the first lap, driven by an aggressive pace set by Ellen Noble (JamFund/NCC/Vittoria). Noble attacked early and went hard after nearly all the entire field went down in the first 30 seconds of the race. As the race went on, the gap between her wheel and the second place rider grew to over a minute. 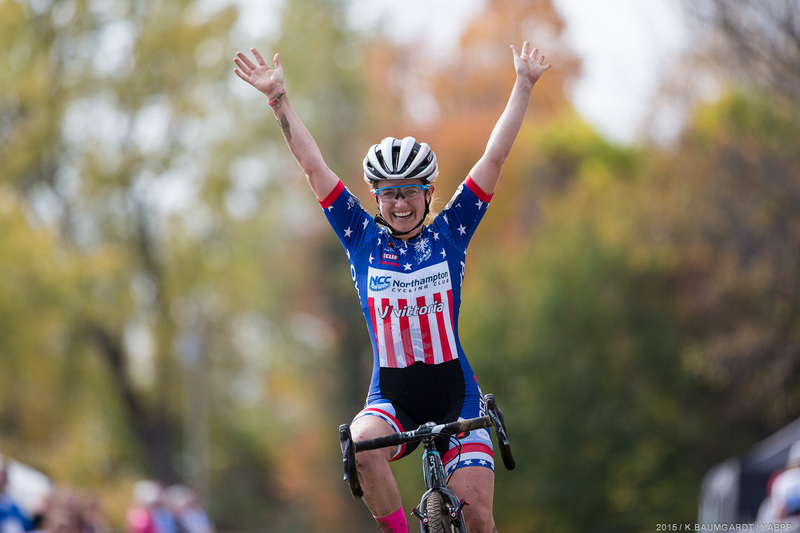 Katie Compton made it two in a row at the Cincinnati International Cyclocross Festival, winning the Elite Women’s Pan-American Championship on Sunday. 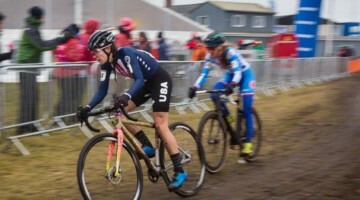 After winning Saturday’s Elite Women’s race Saturday, Katie Compton was unsure if she had enough life in her legs for a repeat performance the next day. She needn’t had worried, as the huge effort didn’t have much of an effect. She pedaled around the course seamlessly with an unfading, machine-like effort, hitting it hard from the beginning and never looking back. Georgia Gould (Luna Pro Team) and Kaitie Antonneau (Cannondale p/b Cyclocrossworld) and a few others were strung out behind Compton, but couldn’t quite match her power or skill. Antonneau had an exciting race, and didn’t stop pounding the sticky mud for a moment. She dropped back into fourth place briefly, and ended up surpassing the other riders and finishing in second. 2015 Pan American Championships Elite Men’s Podium: Jeremy Powers, Jamey Driscoll and Stephen Hyde. But for all the electrifying racing on the day, it was Stephen Hyde’s gutsy performance and Powers’ impressive show-of-force that will have cyclocross fans talking until Nationals. 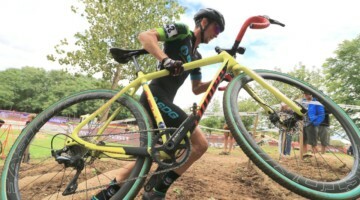 Hyde grabbed the holeshot at the onset of the Elite Men’s race, setting the stage for a one-on-one battle with the reigning national champion for the majority of the contest. The two traded turns at the front, managing to stay a handful of seconds in front of a charging Jamey Driscoll (Raleigh Clement). On the last lap, Hyde and Powers each put in massive attacks, with Powers eventually outlasting the younger rider. Driscoll was also able to pass the Cannondale rider, who would have to settle for the third step on the podium. All three would finish within seconds of each other in the closest race of the weekend. Trying to steal a few seconds, Powers took a big chance going down Pan-Am Plunge, nearly losing overcooking the descent. Use the slider below to see full results from the Pan-American Continental Cyclocross Championships.